Oflag IV-C, the prisoner-of-war camp at Colditz Castle designed to house Allied prisoners who had previously made escape attempts from other camps, was made famous by the BBC television series Colditz in 1972–74. It would be a board game, however, that would truly immortalise the Colditz story in the minds of generations. 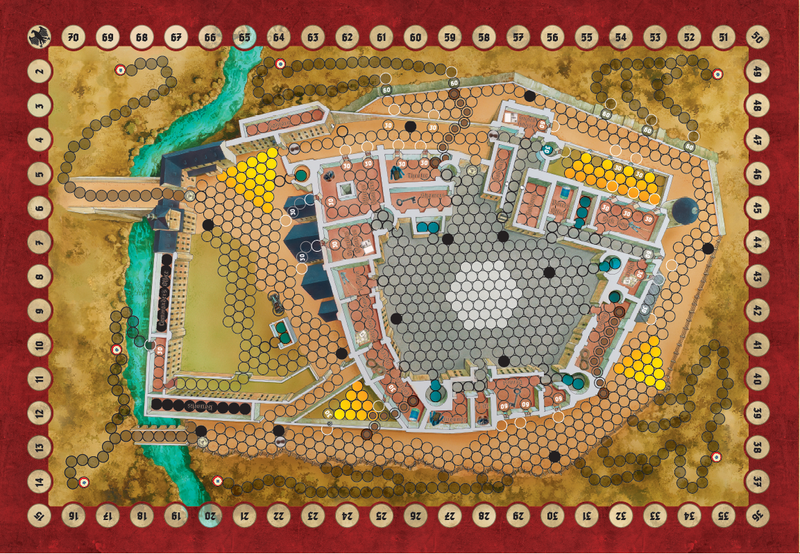 Today, we are proud to release our new edition of that game – Escape From Colditz. Designed by Major Pat Reid, one of only a handful of men to escape from Colditz, and Brian Degas, screenwriter of Colditz, Escape From Colditz captures the drama, tension, and excitement of the attempts to break out from the inescapable fortress. Featuring stunning new artwork by Peter Dennis, an oversized board, 56 wooden playing pieces, 100 fully illustrated cards, a 32-page history book, and unique replicas of artefacts from the prison, we hope that this new edition will both inspire a new generation and allow long-time fans to revisit a board game classic. Escape From Colditz is a game for two to six players, with one controlling the German guards, attempting to maintain order within the prison, and the others playing Allied escape officers, seeking to get their men beyond the walls and to freedom. As the prisoners-of-war sneak through the prison, gathering rope and wire-cutters, forging keys, digging tunnels, and preparing for their escape attempts, the guards must remain wary, patrolling the castle, sending troublemakers to the cells, and reacting swiftly when a breakout is attempted. This new edition of Escape From Colditz includes two sets of rules – the classic set, from the game’s original release, and an updated set, developed in collaboration with Brian Degas. These changes clarify and streamline certain elements in light of more than 40 years of intensive play and better reflect the designers’ original intent. To find out more about these changes, we’ve put together a video laying all of these out. Osprey Games is proud to release its new edition of this legendary board game. Click here to order your copy today!